Welcome to The Hall of Blue Illumination, the podcast dedicated to the world of M.A.R. Barker’s Tékumel. In our longest episode to date, veteran game designer and illustrator Jeff Dee joins our hosts to talk about his experiences with Professor Barker’s setting. Jeff is one of the two-person creative team behind Béthorm, a new, comprehensive rules set for gaming on Tékumel. Béthorm utilizes the Pocket Universe framework, a contemporary RPG system of Jeff’s own design. But before we get to Jeff, our hosts provide an in-depth response to questions submitted by listener Kevin Leung. [00:00:39] Our first email! Listener Kevin Leung is devouring Tékumel material, but still feels that he does not “get” the cultural aspects of the setting. [00:02:21] Victor’s advice to Kevin: the level of detail in Tékumel is often distracting; everyone finds it daunting at some point. Even Professor Barker didn’t always pay attention to every detail in game sessions. [00:04:19] Scott’s observations on learning large amounts of information: there are limits to the amount of information a human can consciously assimilate. But steeping oneself in the material, while certainly enjoyable in and of itself, can yield fortuitous results. [00:05:55] James’s advice: you learn more from actually playing and refereeing Tékumel than from merely reading about it. [00:07:01] Use mistakes in prior sessions as an opportunity to innovate new material. [00:09:09] Don’t try to remember every detail going into a game. A little spice goes a long way. Tease out one specific detail of the setting and focus in on that to provide players with a flavor for Tékumel. [00:10:23] An example of the above using the Tsolyáni concept of shámtla. [00:12:02] Another example, using the smell of musty cinnamon and high chiming sounds — farázhli! [00:12:49] Another suggestion from James: Before every session, make up a list of names and clans with short descriptions of characters the player characters might encounter. This way, you won’t have to create a non-player character on the spot. [00:17:30] Wisdom from the Professor: “There are no non-player characters on Tékumel,” i.e., everyone is just as real as you are. Tékumel is not like other RPG settings where player characters are more significant within the world of the game relative to the non-player characters around them. [00:19:11] Good advice for new referees: if you have a set of rules, stop! Delve into that one thing, and you can mix in more material and research as you go along. [00:21:48] Take time to reflect after your game sessions, and adjust your approach accordingly. [00:23:00] But it is fun to look stuff up and craft something based on it. [00:24:25] “Permeable edges.” Professor Barker’s own approach to questions and their exceptions encourages a holistic approach. For example, Professor Barker’s answer to a question regarding the existence of riding beasts on Tékumel. [00:28:10] The source material shouldn’t be a straightjacket. Have fun running your game. If that’s happening, everything else is secondary. [00:28:40] Artist and game designer Jeff Dee introduced. Jeff’s relationship with the world of Tékumel spans four decades. [00:31:45] Jeff talks about what attracted him to Tékumel. [00:32:58] Jeff discusses his early experiences refereeing EPT, before he had access to a wealth of setting information. [00:35:50] Jeff discusses the adaptation of Tékumel to his own Pocket Universe system. [00:37:45] What was Jeff doing with Tékumel leading up to publishing Béthorm? A long-running campaign involving medium-to-low status clans, with players who have varying degrees of experience with the setting. [00:39:07] After Jeff got comfortable with the Tékumel setting, his approach as a referee has been to toss players in with basic information and to let them figure it out as they go. [00:39:44] The focus of Jeff’s campaign ended up revolving around a player character who turned out to be a conglomerate entity made up of a repaired body (bákte) lacking the other parts of the self (viz. chusétl, hlákme, báletl, penhétl; see Swords & Glory Vol. 1, § 1.620, p. 55) which were in turn harvested from others to create him. The body was a clone of Prince Mridóbu, the character himself a priest of Ksárul, and this created havoc for the players once he started to be recognized. The player was Denis Loubet, artist for Steve Jackson games. [00:41:28] Tékumel allows you to explore science fiction tropes through fantasy. [00:43:05] The distinction between in- and out-of-print has become fuzzy. It is functionally impossible for Béthorm to go out-of-print. [00:45:30] Each person brings their own sense of Tékumel to the table. [00:46:51] Tékumel has a tradition of different rules systems. Béthorm addresses some aspects of player character development that previous Tékumel rules sets have not. [00:48:43] Different games systems suit different styles of play, and what players wanted in 1975 or 1985 isn’t necessarily what they want now. [00:50:35] Jeff plans to continue to support his games with supplemental materials. His next project is The Kúrt Hills Atlas, a regional campaign setting within Tsolyánu. [00:55:05] Jeff references his previous campaigns in Hekéllu, and Pán Cháka near the Temple of Vimúhla, and his work to flesh out those regions. [00:56:21] How the Kúrt Hills region was chosen for Béthorm. [00:57:25] Jeff and Victor both missed a lake in the city of Katalál. This was fixed — eventually. [00:58:40] Jeff created Béthorm‘s maps to match those in the Northwest Frontier Gazetteer and Maps. He wants to facilitate the integration of Béthorm material with existing Tékumel resources. [01:01:55] Random Tsolyáni word generator. [01:02:09] Jeff coins a neologism, “Barkerizing” – to find a more obscure word for a common term. [01:04:46] Everything that one needs to play Béthorm is available at Bethorm.com. Jeff has tried to set up a one-stop shop with links to other Tékumel resources. Katalál Area Map & Gazetteer is also available as a PDF. The Northwest Frontier Gazetteer & Maps is out-of-print. The Kúrt Hills Atlas nears publication. A directory to the 59 fiefs this product will cover is now available here. The random Tsolyani word generator referenced by Jeff. Tekumel Project Miniatures, a range of 28mm scale miniatures for M.A.R. Barker’s Tékumel setting. Great episode. Really enjoy your podcast. Any good starting point for a “new” player? The forum? What would be a good starting collection of pdf’s concerning tekumel? 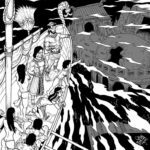 I’d start with the Empire of the Petal Throne PDF on rpgnow.com. You might want to check out Prof. Barker’s first novel, _Man of Gold_, as well. It’s available for Kindle and in paperback. These two sources will give you a great starting point to begin your Tékumel journey.